Posted on Wed, Dec 2, 2009 : 5:56 p.m. Longtime Ann Arbor music educator Robert Pratt, 83, died Tuesday in Jackson. He had been battling cancer for the past six months. For 25 years, Pratt was chairman of the music department, director of choral activities and founder of the music history portion of the humanities program at Pioneer High School. His name is listed on the Ann Arbor Public Schools’ Roll of Honor. He was also involved in a host of local musical endeavors, and conducted the annual Community “Messiah” Sing from 1988-2007. Long active in church music, Pratt was director of music at Ann Arbor’s Zion Lutheran Church and conductor of the Chancel Choir at the First United Methodist Church. 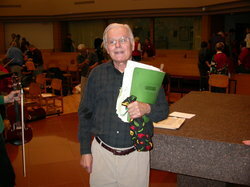 He was the founding conductor of the Plymouth Oratorio Society and also conducted the Ann Arbor Cantata Singers. His involvement with the Youth for Understanding Chorale from 1964-73 led to 10 tours of Europe and South America, appearing in major concert halls and on radio and TV. After the chorales ended, Pratt and his wife, Mary, spent a sabbatical year in Brazil studying Brazilian culture and music and conducting and teaching. He conducted a reunion concert of the Youth for Understanding Chorale in June 2008. He received his degrees from Oberlin College Conservatory of Music and the University of Michigan School of Music. Westerman said Pratt “is fondly remembered by 18 years of singers at Ann Arbor High School and Pioneer High School. A member, song leader and past president of the Ann Arbor Rotary Club, Pratt was designated an Honorary Paul Harris Fellow, Rotary's highest award, and was recently honored with emeritus status. Ingrid Sheldon, Rotary past president, former Ann Arbor mayor and former student of Pratt’s, said she is saddened by Pratt’s passing. His legacy will be as a music educator “who recognized the value of music and fine arts and the education of the whole child, as well as being a real leader in musical education, especially for high school youth,” Sheldon added. A private service for family has already been held. A memorial service is planned for early January at First United Methodist Church in Ann Arbor, where he had been a conductor for a number of years. Those arrangements, including the date, are incomplete. He is survived by his wife Mary, three children, 10 grandchildren and 8 great-grandchildren. Roger LeLievre is a free-lance writer who covers music for AnnArbor.com. Tue, Dec 8, 2009 : 12:25 a.m. I had the good fortune to sing under Mr. Pratt's direction at Ann Arbor High from 1958 to 1961: The King and I, The Faure Requiem, Brahms Lieder. Thank you Mr. Pratt for the great gift of your life. It is like yesterday - you standing, ready for us to begin, with your hand at your side, jet black hair, black rimmed glasses, upright, filled with the music of our souls. I continue to sing, thinking of You. Thank you. Sat, Dec 5, 2009 : 11:17 p.m.
Fri, Dec 4, 2009 : 8:47 a.m. I am sorry to hear of Bob Pratt's passing. I was in the Chorus and A Capella choirs at Ann Arbor High 1962 to 1965. He was one of the teacher's that made a lasting impact on my life. He demanded excellence and in so doing knew that it would bring out the best in us not only musically but also personally. His contribution through his musical gifts was felt not only locally but globally as well. My sincerest condolences to the Pratt family. Thu, Dec 3, 2009 : 11:03 p.m. I was lucky to have Mr. Pratt as a teacher beginning in 8th grade when I was in "The King and I." I learned from him throughout my high school years at Pioneer, singing in choir and performing in several more musicals. He was a great teacher who respected his students and earned their respect in return. Thu, Dec 3, 2009 : 5:15 p.m. In my senior year at Pioneer in 1969-70 I took Humanities and met Mr Pratt. I remember how every day he came to class dressed to perfection. He was very serious and expected each student to take his passion seriously. I took Humanities because I wanted to connect art and literature to history. I knew nothing about the history of music. Mr Pratt added that forth component and changed the way I listened to music forever. The Humanities program that he helped build is one of the best classes any high school student can take. Mr Pratt was the kind of teacher I wish we had more of. I will remember him and send my regards to his family. I am sorry for your loss. Thu, Dec 3, 2009 : 4:26 p.m.
singing in bob pratt's choir was a joy. thank you, sir. rest in peace. now it's our turn. are we up to it? Thu, Dec 3, 2009 : 1:35 p.m.
Thu, Dec 3, 2009 : 1:23 p.m.
My sympathies to Mary Pratt, Don Pratt and family. What an honor to have known and been conducted by Robert Pratt. His unique love of music and people (Onward Ye People) in every way, and for the better, changed the lives of all those who were privileged enough to meet him, know him, or be conducted by him, all the world round. I met him in 1964 at just 17, when he suddenly and gingerly took over as the conductor/director of the Ann Arbor based Michigan Youth Chorale; and bravely and lovingly agreed to take 66 Michigan teenagers for a 2 month tour of Brazil, Uruguay, Argentina and Chile. In 1964, South America was an unknown place to most "North Americans"--referenced as a jungle with the Amazon River running through it. But as Teenage Ambassadors (Lord Make Me An Instrument Of Thy Peace) we learned and sang our way through the hearts of the wonderful people of America Latina. A first for us all, but the beginning of a wonderful 45 years of knowing, growing and singing under Bob Pratt. The Michigan Youth Chorale, the Alumni Chorale and all the Reunions at Hill (I'm Going To Sing When the Spirit Says Sing). Not only will he be missed, he can never be replaced. Thu, Dec 3, 2009 : 10:42 a.m. I've truly lost one of my heroes as I'm sure all YFU ALUMS will agree.The Angelic Choir will certainly be in finer voice now.God Bless you Bob Pratt,it was an honor to have known you and my prayers go out to your family.You will be terribly missed. Thu, Dec 3, 2009 : 10:12 a.m.
Thu, Dec 3, 2009 : 9:50 a.m.
Thu, Dec 3, 2009 : 9:36 a.m. Wed, Dec 2, 2009 : 11:22 p.m. He also was the Head Usher for University Musical Society events for many years. Wed, Dec 2, 2009 : 10 p.m. Wed, Dec 2, 2009 : 9:23 p.m. Thank you Jan. The story has been updated to reflect the correct number of great-grandchildren. Wed, Dec 2, 2009 : 9:03 p.m.